Real-estate developer David Sabey’s support of Swedish’s Cherry Hill campus has had broad benefits for Swedish — and for Sabey. But as hospital executives draw a benefactor close, that relationship can complicate efforts to maintain control over medical programs. As he was leaving Swedish Health’s Cherry Hill campus one evening earlier this year, Dr. Charles Cobbs received a call on his cellphone. The neurosurgeon had been raising concerns that Swedish’s commitment to patient safety was wavering. Now, on the other end of the phone, someone was asking if he would back off his remarks, according to a memo Cobbs sent the next morning. The caller wasn’t a Swedish co-worker or boss or anyone with a medical degree. It was David Sabey, a powerful real-estate developer who is one of Swedish’s largest donors and also its landlord at the Cherry Hill campus. Sabey, according to Cobbs’ memo, told the surgeon he could face legal action from people at Swedish that would “significantly impact” him and his family for years. “I consider Mr. Sabey’s statements to me a threat, completely inappropriate and possibly illegal,” Cobbs emailed Teresa Bigelow, chair of Swedish’s board of trustees. Sabey disputes Cobbs’ characterization of the call, but his intervention illustrates how much the developer has become embedded within the Swedish organization, where he has wielded influence as a critical partner in an ambitious effort to build a world-class institution. Surgery was supposed to mean a better life for Talia. But something went wrong. While it’s common for hospitals to have close relationships with their top benefactors, prominent experts in nonprofit and health-care law say the Swedish-Sabey alliance has developed an unusual interdependence, setting up potential conflicts and pitfalls that some organizations work to avoid. More than a decade ago, Sabey’s namesake real-estate corporation purchased 40 percent of the Cherry Hill site — the campus where he was born 70 years ago. Since then, the former University of Washington football player-turned-businessman has helped the hospital develop growth strategies, raised millions of dollars for programs, and launched an educational foundation that has elevated the stature of Swedish physicians. Along the way, Sabey’s company has collected millions of dollars in annual rent from Swedish and embarked on a for-profit venture with its parent organization. He has helped connect device companies with surgeons and propelled a contentious plan for taller buildings in the campus neighborhood where his business now owns $150 million in real estate. And, in part with the use of his private jet, Sabey has helped recruit top surgeons such as Dr. Johnny Delashaw, a high-volume star who resigned this year amid concerns that Swedish was prioritizing profits over patient safety. Delashaw’s methods are what initially compelled Cobbs to complain internally, and his concerns were among those quoted in a Seattle Times article in February. After The Times’ story, Swedish’s CEO also resigned, and the state suspended Delashaw’s medical license. Hospital regulators and the U.S. Department of Justice launched investigations. Sabey’s call to Cobbs came days after the article was published, with the neurosurgeon recalling in his memo that Sabey had initially asked whether Cobbs was willing to work things out in a meeting with Delashaw. The memo was released to The Times by state officials under public-disclosure laws. “In Swedish’s long relationship with David Sabey, we have examined the relationship on numerous occasions to ensure we are in ongoing compliance,” Swedish officials said in a statement issued through a spokesman. Sabey declined to be interviewed, but in emails to The Times he noted major moments when his involvement was at the invitation of hospital leaders. He said he’s personally known people whose lives have been saved by doctors at Swedish, and cited his long history of philanthropic support for health organizations. “It is my way of giving back to Seattle, which I believe can be one of the greatest medical communities in the country,” Sabey said. The Cherry Hill campus, constructed in 1911, was once a cornerstone of the Providence hospital system. But as financial losses mounted at the turn of the millennium, Providence turned the campus over to Swedish as part of a larger deal. With Swedish’s main hospital just a half-mile away, the acquisition set up an imperfect scenario: The sites were too close together to offer similar services but too far apart to easily shuffle patients or physicians back and forth. The campus was also losing money and needed substantial upgrades. In 2002, Sabey provided Swedish a way to overhaul the dilapidated buildings. He purchased 40 percent of the Cherry Hill campus for $37 million and announced a plan to invest $40 million in renovations. Swedish leaders launched an effort to turn Cherry Hill into a specialty hospital, anchored in part by a neuroscience institute. Records show Sabey’s intimate role from the beginning. In a PowerPoint presentation obtained by The Times, Sabey pitched the Swedish board in 2005 on a grand plan for a neuroscience and cardiovascular “center of excellence” that would dominate its regional competition and potentially rival places like the renowned Cleveland Clinic. Sabey said the presentation to the board wasn’t his idea. It was done at the request of then-CEO Richard Peterson, who died in 2008, and was based on a plan Peterson had outlined, Sabey said. Former Swedish CFO Ron Sperling, however, recalled Sabey was assertive in his broader involvement at the hospital, which forced executives to find a balance. And Tom Malone, a Swedish board member at the time, said he remembered Sabey wanting assurances that Swedish wouldn’t abandon the site and leave him with a dying campus. 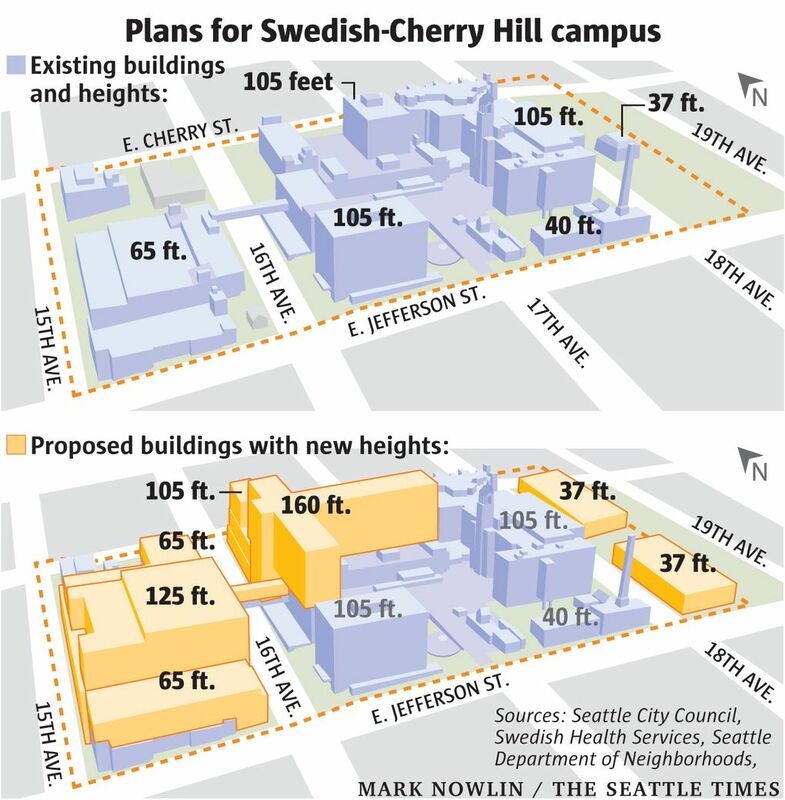 Over the years, after Sabey took his stake in the land and buildings, some Swedish officials considered shuttering the Cherry Hill campus and investing in needed upgrades at the main campus on nearby First Hill, said Marcia Peterson, who was Swedish’s director of strategic planning from 2007 to 2014. 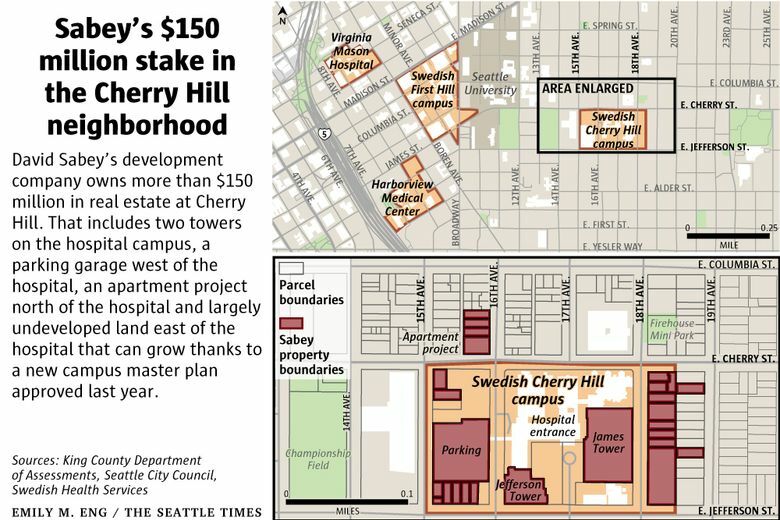 Sabey, meanwhile, was investing in the Cherry Hill campus and neighborhood. In 2006, Sabey Corp. helped launch a business, Seattle CyberKnife, that provided the hospital a cutting-edge robotic device to help Swedish doctors treat cancers in one of the towers he owned. Then, in 2008, Sabey and his wife pledged $2 million to help Swedish build a brain-tumor center in one of his towers. Swedish celebrated Sabey in its magazine, where he at times appeared in photos with Rod Hochman, who was Swedish’s CEO before elevating to lead Providence when the organizations merged in 2012. The developer continued to acquire properties surrounding the Cherry Hill campus in 2006, 2007 and 2008. Sabey had laid the foundation of his powerful and prosperous real-estate business in the 1980s, when he pursued a similar strategy of acquisition and development surrounding Boeing facilities and made a windfall from the aerospace company’s ensuing growth. He has continued to demonstrate a penchant for investing in upcoming trends, concentrating recently on data centers — including the $120 million purchase of most of the former Verizon building in lower Manhattan — and health care. 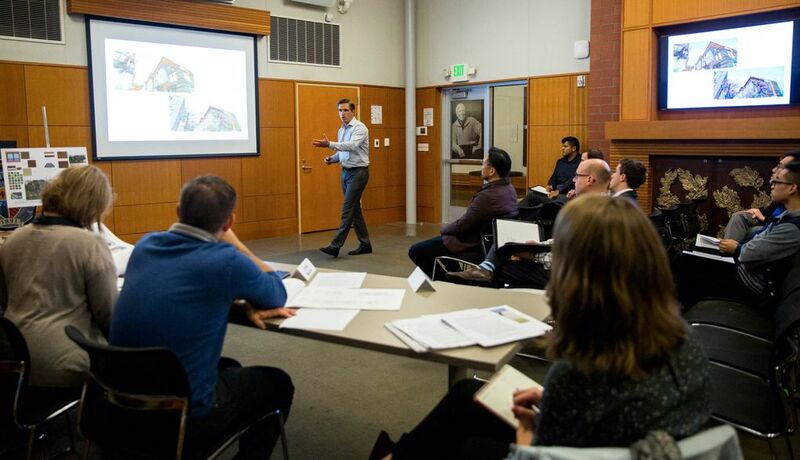 In 2012, Providence and Sabey embarked on a joint venture — MultiScale Health Networks LLC — to advance health-care data analysis, putting the two sides in a for-profit partnership. Sabey said at an event earlier this year that Providence’s “entire database” now resides at a Sabey data center. Swedish also has leaned on Sabey for his fundraising prowess, tapping him to co-chair a $100 million campaign. More than $20 million from that effort, according to a Swedish magazine, went to neuroscience programs, such as centers for brain tumors and multiple sclerosis that are located in the two towers Sabey controls at Cherry Hill. Sabey’s daughter-in-law, Diane Sabey, now chairs the board of governors of Swedish’s fundraising arm — a board that oversees how donated money gets spent. Financial ties between nonprofits and their managers or major donors are regulated by federal tax law, which prohibits improper benefits such as excessive compensation or lease agreements that pay more than fair market value. John D. Colombo, a professor who specializes in nonprofit issues at University of Illinois College of Law, said intimate financial ties between nonprofits and insiders worry him because they set up potential situations that could violate tax law. But, Colombo said, it’s an enormous challenge for the IRS to determine whether a decision provides too much favor to an insider, so the agency rarely pursues such cases. Swedish said it has a robust compliance program and contract-review process to ensure that its deals with Sabey are fair and appropriate. “All transactions with Mr. Sabey’s companies are negotiated at arms’ length and reviewed through the same process that would apply to any other third-party vendor,” Swedish said. Sabey said comparing lease rates involves evaluating many factors, such as the duration of the lease, the type of space and building improvements. He said Swedish’s wide range of lease rates — maxing out at $34.50 per square foot annually, including taxes, insurance and maintenance — are at the “low end of the fair market value range” and he pointed to third-party data from places like CoStar. CoStar, a real estate data firm that standardizes rates to compare them, provided reports to the Times showing that medical office lease rates at Cherry Hill have kept pace with those at the city’s main hospital campuses on First Hill and in some years have been higher. Swedish has said in city documents that it leases more than half of Sabey’s space in the James and Jefferson towers on the campus. Based on the square footage in those buildings and the lowest rental rate that Sabey cited, Swedish would be paying Sabey at least $5 million per year for rent. Sabey said if his goal were maximizing profit, biotech would have been a better use of the space. “I made that choice because of my long-standing interest in nonprofit hospitals and what they can bring to the community,” Sabey said. 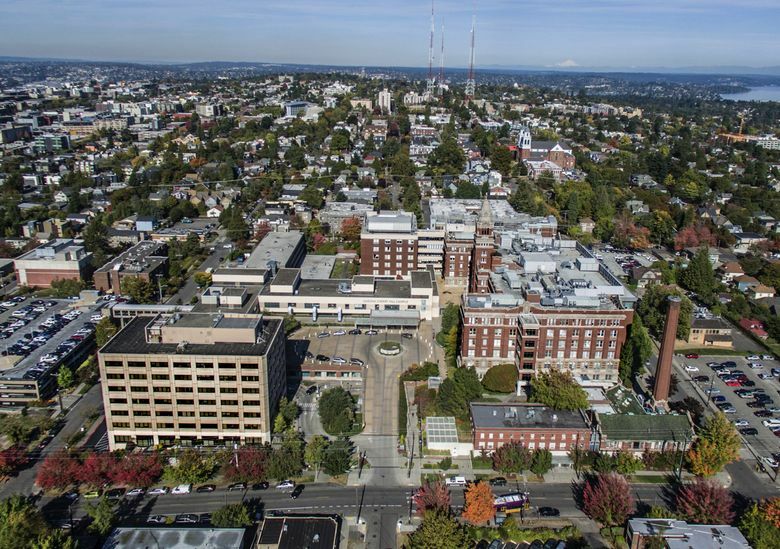 Higher-education campuses and hospitals get special treatment in Seattle, allowed to exceed zoning standards that would otherwise apply to developments in their neighborhoods. To do that, the institutions work with neighbors and the city to develop a master plan. While Swedish had no appetite for expanding its Cherry Hill site in the late 2000s, Sabey pushed the institution to pursue growth in an updated master plan, said Peterson, the former strategic planning director. She recalled laughing during an early meeting in which Sabey laid out “massive” plans for growth. She said Sabey expected neighbors would be outraged — and that he already had a backup plan he knew would appear more palatable to them. Even then, the more moderate proposal wasn’t popular with nearby homeowners. Sabey had a growing financial stake in the neighborhood through a network of LLCs and had acquired properties beyond the area considered for taller building heights, including one set of parcels across the street from the hospital that’s held by a Sabey entity called 16th & Cherry LLC, which is now seeking to build a 47-unit apartment complex. By early 2013, according to records, neighbors were expressing widespread concerns about traffic and parking. Swedish and Sabey were arguing that the space was necessary, citing an aging population and growing demand for services such as neuroscience. Sabey said he was supporting Swedish’s efforts and still believes in the community benefits that can come with growth at Cherry Hill. 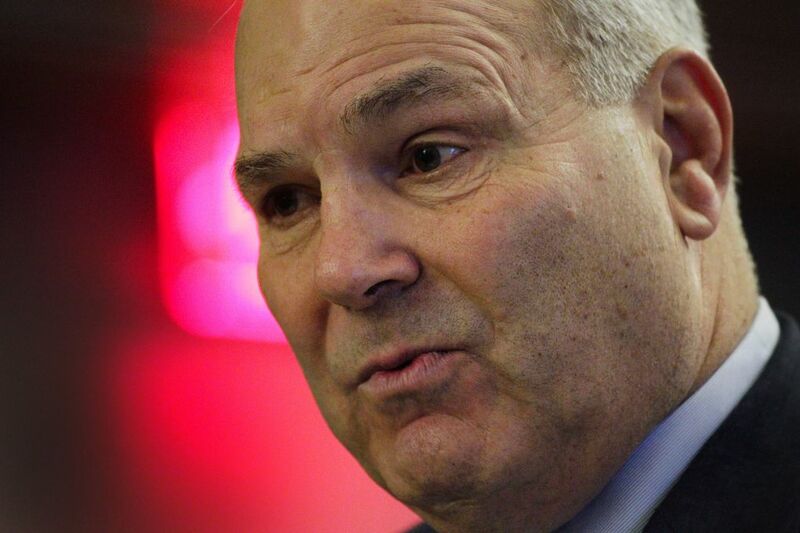 Delashaw didn’t name the person who got in touch with him, but two people familiar with his recruitment said he was brought to Seattle in May of that year to a dinner at The Metropolitan Grill with Hochman, a few medical leaders and Sabey. Sabey said he attended the recruiting dinner — using his airplane to bring Delashaw up — at the request of a Swedish surgeon. Two people recall seeing an architectural drawing that portrayed an expanded Cherry Hill campus with a building bearing Delashaw’s name on the side. 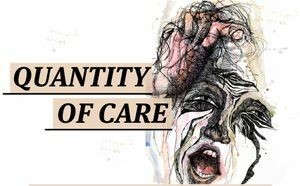 Sabey called the image “a lighthearted way to inspire Dr. Delashaw to envision the future of” the neuroscience institute. 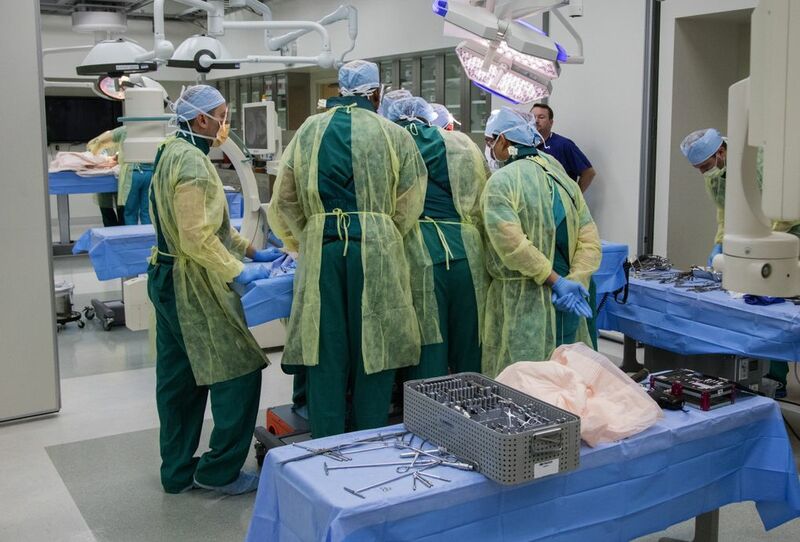 Delashaw, after arriving at the Cherry Hill campus near the end of 2013, became a critical component in Swedish’s growth, quickly emerging as the top-producing brain or spine surgeon in the state despite consternation among staff about his patient care. Meanwhile, discussions among Swedish, Sabey and their Cherry Hill neighbors were not going well. Records show the proposed master plan included a potential hotel on Sabey property. It also sought new building heights across the street to the east of the hospital, where Sabey had acquired a block of parcels. Steve Sheppard, who was involved in the city’s major-institution projects for decades until his retirement from the city last year, said the effort was perhaps the most contentious he ever encountered — with the Swedish-Sabey alliance pushing back against opposition harder than institutions usually do. Swedish said in a statement that it collaborated closely with neighbors and took helpful feedback about the design. In June 2014, Swedish and Sabey had a chance to speak with then-Mayor Ed Murray about the future, a meeting held over dinner at Sabey’s $15 million lakefront mansion, according to records. Months later, the administration’s planning department recommended approval of the new Cherry Hill master plan. Neighbors appealed, taking the case in 2015 to a city hearing examiner. At the hearings, the Swedish-Sabey alliance put forth Delashaw to testify. The surgeon said that over the previous 18 months the neuroscience institute had grown 34 percent and that he anticipated “dramatic increases” in the future. But others used their testimony to express concern about the plan. Bernadette Haskins, a nurse in the operating room at Cherry Hill, told officials she had seen changes impacting patient care. “The focus used to be more on patient care. Now I feel a lot of pressure for the bottom line,” she said at the hearing. The hearing examiner and then the City Council ultimately advanced the new master plan with some modifications. One of the places that Swedish’s fundraising arm has sent its money in recent years was to an outside organization that Sabey had founded — the Seattle Science Foundation (SSF). Sabey had created the foundation in 2006, in the early days of Swedish’s neuroscience institute, as a place to foster medical advancements through education and innovation. He placed it on the sixth floor of his James Tower at Cherry Hill. Swedish doctors and the foundation have regularly collaborated to put on events, and the foundation board has included top officials from Swedish and Providence. The organization’s president is Dr. Rod Oskouian, a Swedish spine surgeon who performed about as many operations each year as Delashaw. The foundation touts professional training and education, and has helped showcase Swedish doctors to the world, featuring them in educational classes broadcast on YouTube. But among the big drivers behind the foundation are medical-device companies that donate money, sponsor some of its classes and sometimes, in return, get a chance to demonstrate their wares to doctors. Synaptive, a company specializing in surgical tools, last year paid the foundation to produce a 3-minute promotional video, including $5,000 each for Oskouian and Delashaw to appear in it giving testimonials, company spokeswoman Elizabeth Monier-Williams said. Federal transparency laws adopted in 2010 require companies to report payments or benefits given to doctors or teaching hospitals. Synaptive said it paid the money to the foundation — not to the doctors or Swedish — and it was up to the foundation how to use the money. A spokesman said the doctors were not compensated. Synaptive representatives have since written letters supporting Delashaw’s effort to get his medical license reinstated. Dr. Jerome P. Kassirer, a former editor-in-chief of the New England Journal of Medicine, said even small perks from a private company can cloud a physician’s judgment and lead to decisions that aren’t in patients’ interest. He said it circumvents transparency laws to send donations to an educational nonprofit that get passed on to doctors, whether in the form of stipends or events that give them publicity. “The talks like the ones you’re describing — fundamentally, that’s advertising,” Kassirer said. Some device companies donated to the foundation on a regular basis. Synaptive said it has paid about $100,000 in grants and fees to support 13 events this year. Medtronic, a company that specializes in medical devices, donated more than $125,000 in 2015 to support several different courses. That year, a representative of the surgical-equipment company Stryker, a competitor of Medtronic’s, emailed Dr. Oskouian to help set up an in-person testing of a new drill. Then, according to the emails obtained by The Times, the company’s salesman hinted at some time together doing an adventure sport. “We also may need to bust out the dry suits soon,” the representative wrote with a smiley face. A few months later, the foundation held a nine-hour conference branded with the Stryker name. While the foundation has had a continuous series of events and sponsors, the nonprofit’s finances ended several recent years in the red. By the end of 2013, tax records show, the organization had liabilities of $8.2 million — almost double its assets — and much of the liability was debt to Sabey, whose company was also getting more than $600,000 in rent annually from the foundation. Sabey said the organization was a startup where financial support was necessary. “SSF is a great success and now generates enough revenue to sustain itself financially. I was happy to support it,” Sabey said. By the end of 2014, the organization found a new way to stabilize its finances: Providence and Swedish contributed $5 million, shoring up the balance sheet, according to tax records. Then Providence announced that the Science Foundation was moving under its umbrella. Oskouian and two top Providence officials now serve on the foundation’s board. Sabey, who says he eventually donated the loaned money to the organization, remains the board chair. Sabey’s son Joe is also on the board, while at the same time overseeing leasing deals for all of Sabey Corp. That includes the company’s dealings at Cherry Hill. Did you find this story valuable? Support watchdog journalism at The Seattle Times by subscribing. See our offers here.